There are angels over Berlin, or so Wim Wenders visualised in his 1987 film 'Wings of Desire' (Der Himmel über Berlin). 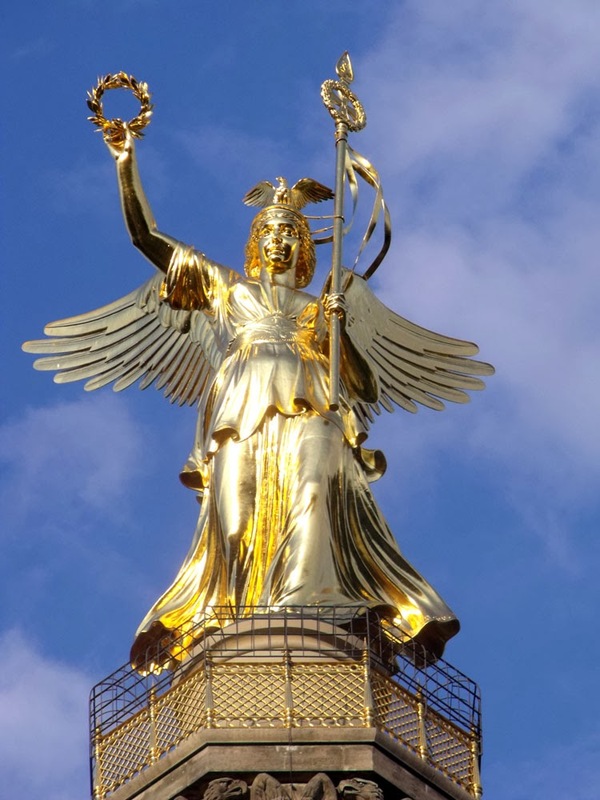 And one of their meeting points was on top of the Siegessäule (Victory Column) beside the greatest angel of them all, Goldelse! 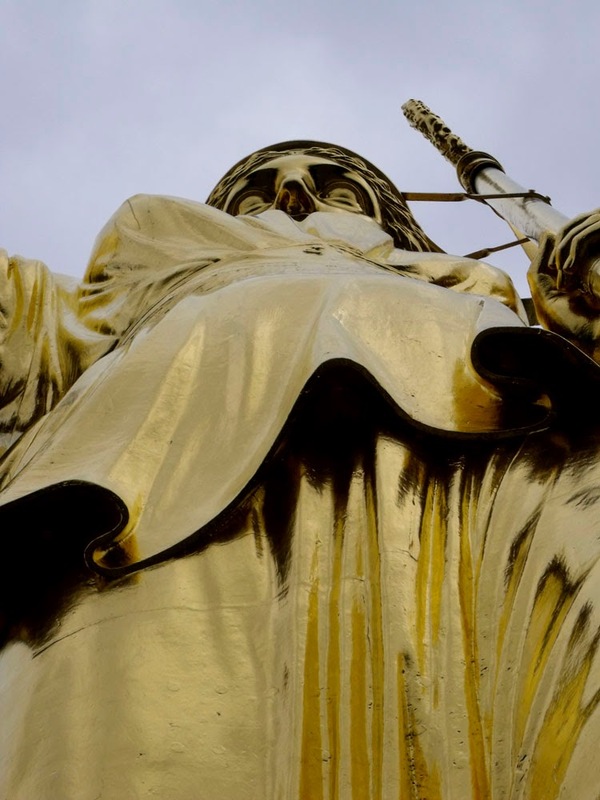 Goldelse is the affectionate nick-name given to the 35 tonne, 8.3 meters high statue designed by Friedrich Drake. 'Else' (pronounced 'EL-sə') is a German woman's name and is a diminutive of Elisabeth. 'Gold' is 'gold'. So her name translates as something like 'golden Lizzy'. Her real name is Viktoria, and is a representation of the Roman goddess of Victory. Like the goddess (and her Greek equivalent Nike), Goldelse is winged and brings a laurel wreath for the victor. 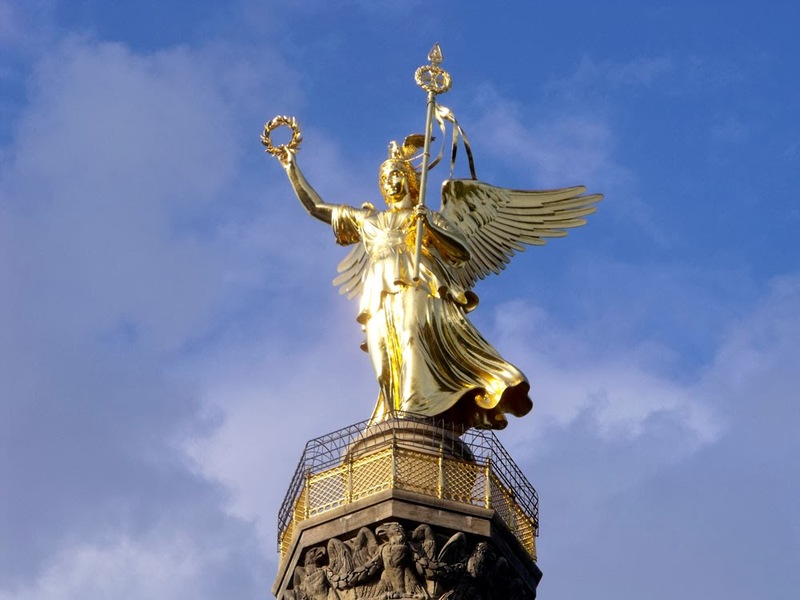 Unlike the goddesses, she holds a German battle standard in her left hand, topped with the symbol of the Iron Cross, which had been designed by Karl Friedrich Schinkel as a military decoration that was first awarded in 1813 during the Napoleonic Wars. With an eagle perched on her head, she could also be a personification of Borussia (the latin name for Prussia). And in fact, it is said that she is modeled in the likeness of Victoria, then Crown Princess of Prussia, who was the eldest child of Queen Victoria of the United Kingdom and Prince Albert, and was born at Buckingham Palace. The Crown Princess Victoria - also a princess to the UK throne of course - was often known as die Engländerin because of her background and her liberal Anglophile views. She was married to Prince Friedrich Wilhelm of Prussia, who on 9th March 1888 would become Emperor (Kaiser) Friederich III of Germany (and she Empress and Queen of Prussia). Poor Freddy only reigned for 99 days, as he died of throat cancer on 15th June. 1888 wasn't a good year for German emperors - there were three that year, causing it to be known as the Year of the Three Emperors. German schoolkids remember this with the mnemonic 'drei Achten, drei Kaiser'. The third Emperor was Victoria's son, Kaiser Wilhem II, who led Germany into the First World War. It is somewhat ironic really that the likeness of Crown Princess Victoria, the liberal Anglophile who was always at odds with the authoritarian German Chancellor Otto von Bismarck, stands atop a monument commemorating the victory of Prussia over three other European countries that Bismarck had war-mongered. These triple victories were The Danish-Prussian War of 1864, The Austro-Prussian war of 1866, and The Franco-Prussian War of 1870-71. When architect Heinrich Strack - an apprentice of Karl Friedrich Schinkel by the way - first began the Siegessäule project in 1864 it was to be just to mark the victory over Denmark. But you know how it is with project-shift; the goal-posts kept changing as Prussia kept winning wars. When the Siegessäule was finally inaugurated on 2nd September 1873, Strack had designed in three rings to the column, to commemorate each of the three victories. For good measure he also added gilded cannon barrels captured from each of the three conquered armies. "Hang on a minute Andie", you cry; "looking at the photo you've shown us, there are clearly four stages to the column, not three!" And you are entirely correct. 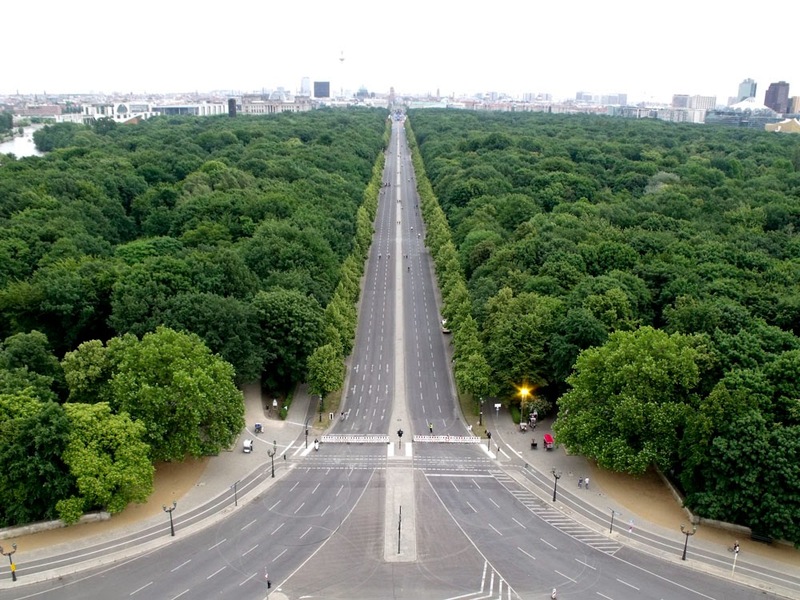 The fourth ring was added in 1938-39 by that rascal Herr Hitler, who also had the Siegessäule moved from its position in front of the Reichstag Building to its present location at the centre of the Großen Stern. 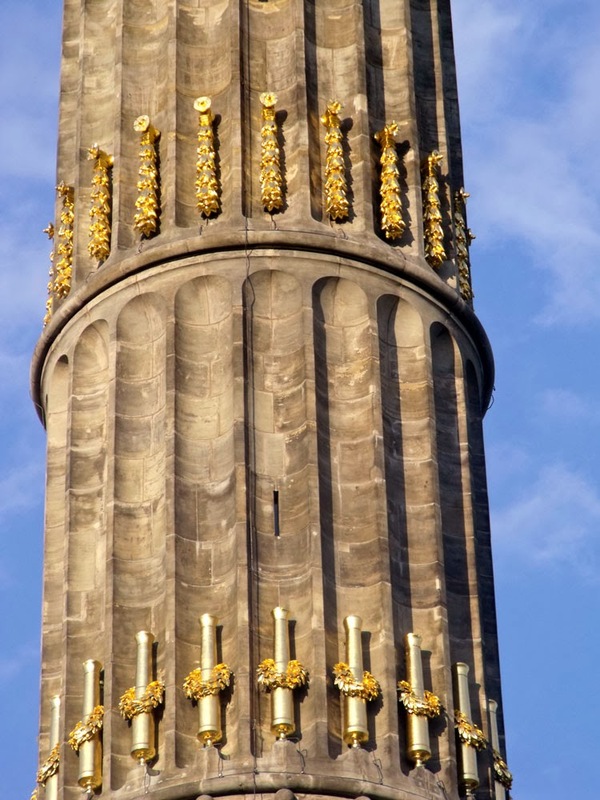 Hitler hadn't accrued any cannon barrels by then, so his architect Albert Speer added golden garlands instead. 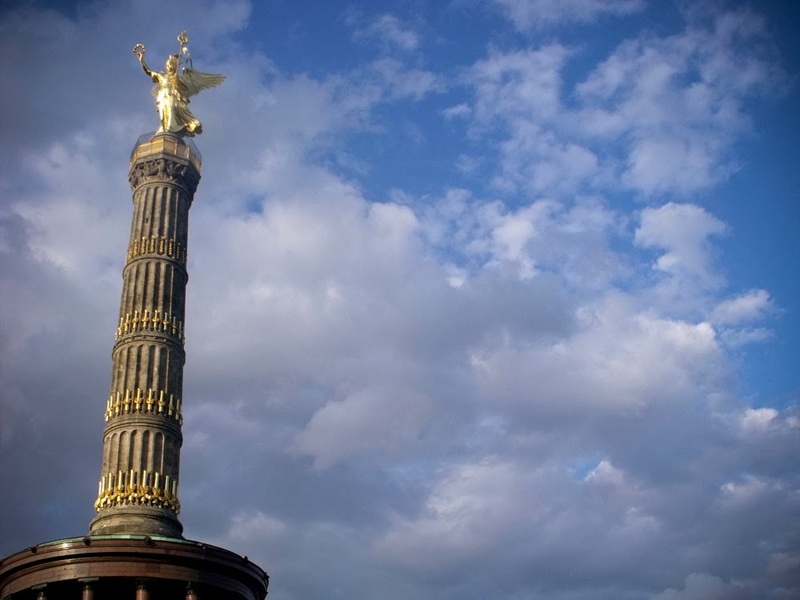 Fact-fans might like to know that the total height of the Siegessäule column, from its base to the tip of Goldelse's golden standard, is 66.89 metres tall. Add in the base and let's call it a round seventy. Gilded cannon barrels and golden garlands. Stages three and four of the Siegessäule Sky-Rocket. 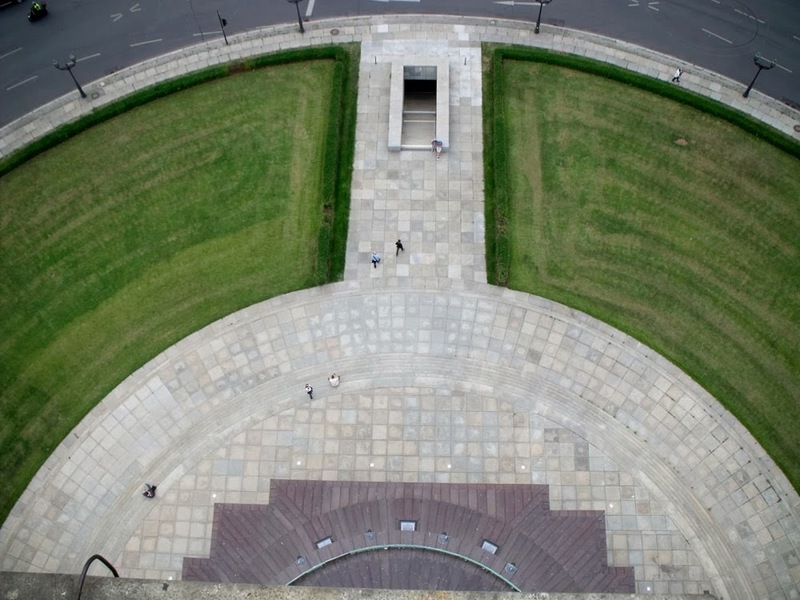 It is unlikely that Hitler added the fourth ring in anticipation of further wartime victories for Germany, as the Großen Stern was widened and arranged specifically as a memorial place for the achievements of the Second Reich, along with statues of Bismarck, and Field Marshalls Moltke and Roon (also plucked from in front of the Reichstag). Hitler and Speer had much bigger plans for commemorating the eventual victory of the Third Reich which involved rebuilding Berlin on a mega-scale and renaming it Germania, capital of the World. The Siegessäule stands in the middle of a traffic island called the Großer Stern, and access to it is through subways whose entrances are four vaguely-neo-classical 'temples' also designed by Albert Speer. 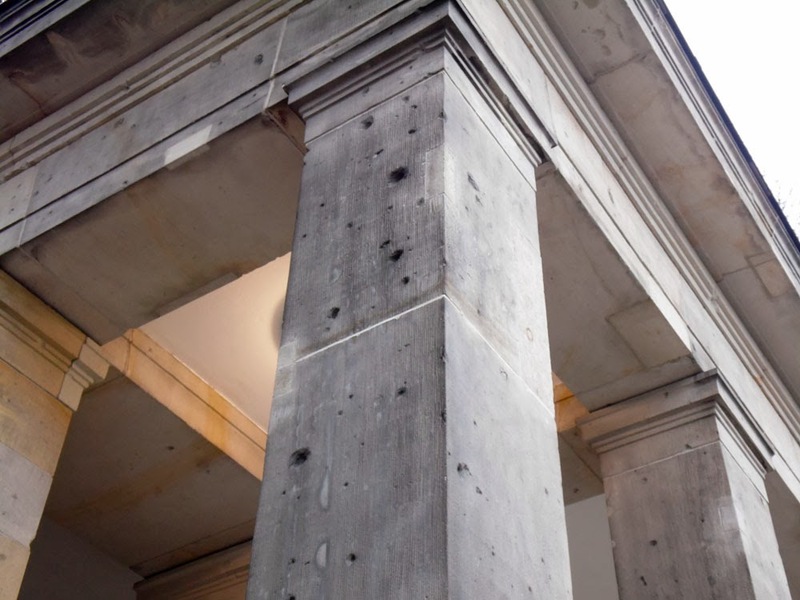 If you look at these 'pavilions' you will see remembrances of the Second World War in the form of bullet and shrapnel scars. 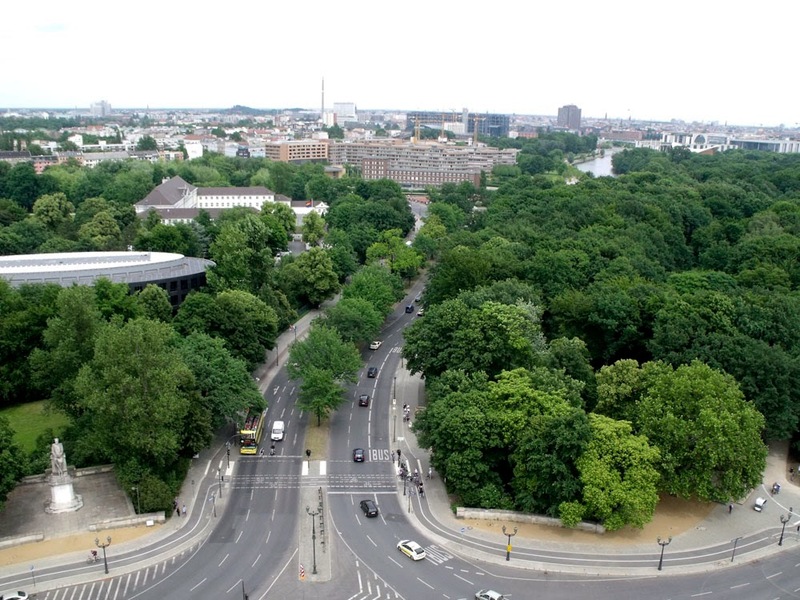 In the final days of the war, the whole area around the Reichstag was a fiercely contended battle-field as the Soviet Army trundled relentlessly towards the centre of Berlin amidst a storm of bombs, missiles, and hand-to-hand fighting. 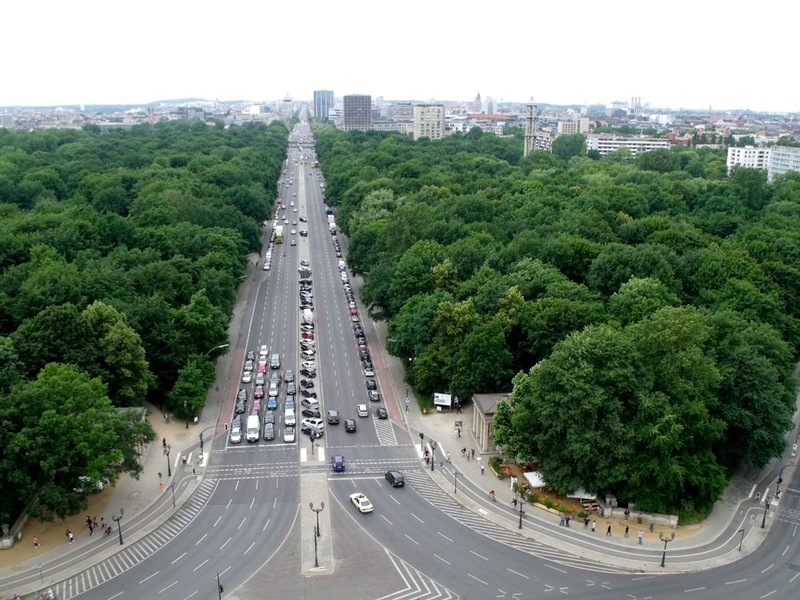 The Straße des 17. Juni in which the Großer Stern lies had been widened by Speer to make a magnificent East-West Axis for the planned new World capital. This was no doubt wonderful for holding awesome processions of the Wehrmacht army on a totalitarian scale (and in the last days of the war as a last-ditch landing strip for flying generals in and out of Berlin), but it also provided a direct route for the Red Army tanks moving on to the Reichstag and then the bunker under the Reich Chancellery where Hitler and the rump of his military leaders. That the Siegessäule was still standing at the end of the Battle for Berlin was not so much luck than it was an obvious landmark the Soviets could direct their soldiers to make for. 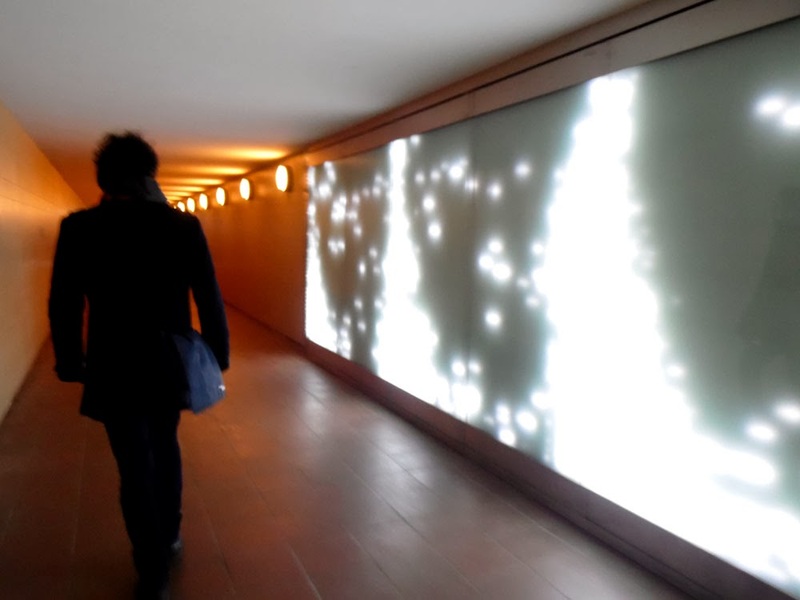 The subways under the Großer Stern have been livened up with a lighting art-installation, but never-the-less have the smell of impatience that all subways have. 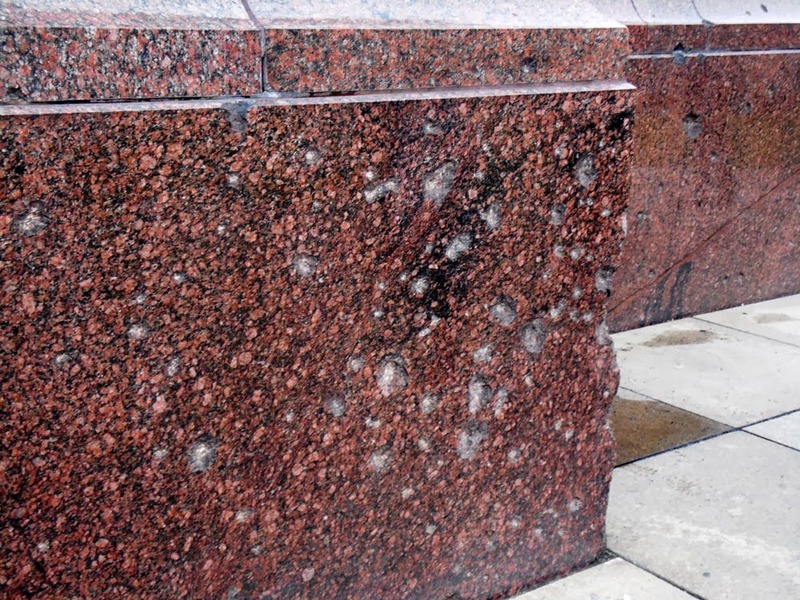 The square base of the Siegessäule is made of polished red granite surmounted by a circular collonade of pillars with a glass mosaic by Anton von Werner. Base of the Siegessäule looking up at the hall of pillars. 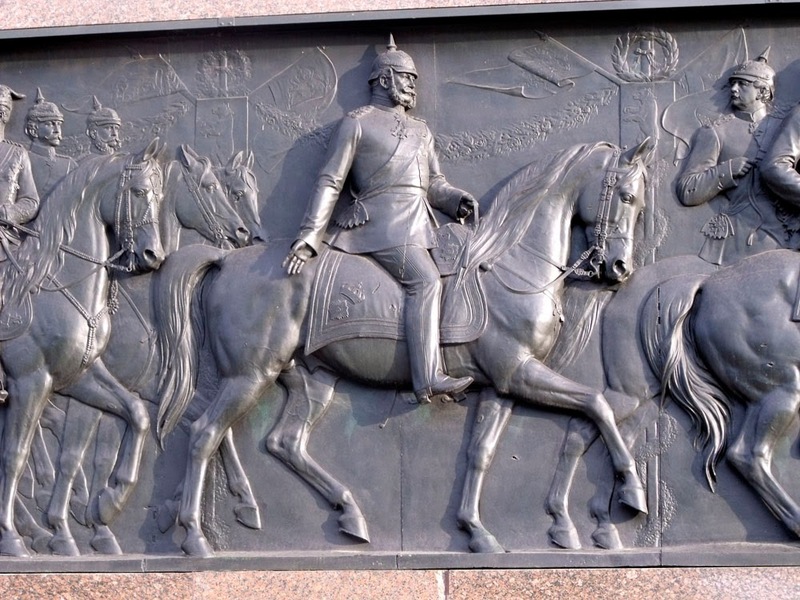 Around the square base are four bronze reliefs depicting scenes from the wars of unification and the victorious entry of the troops into Berlin in 1871. Prussia victorious! Love the pickelhaube helmets! The above panel is in good condition, whereas the other three have bullet holes and extensive damage. There is a reason for this, because at the end of the Second World War the French actually wanted to have the Siegessäule blown up, being a symbol of Prussian militarism and particularly France's defeat in 1871. 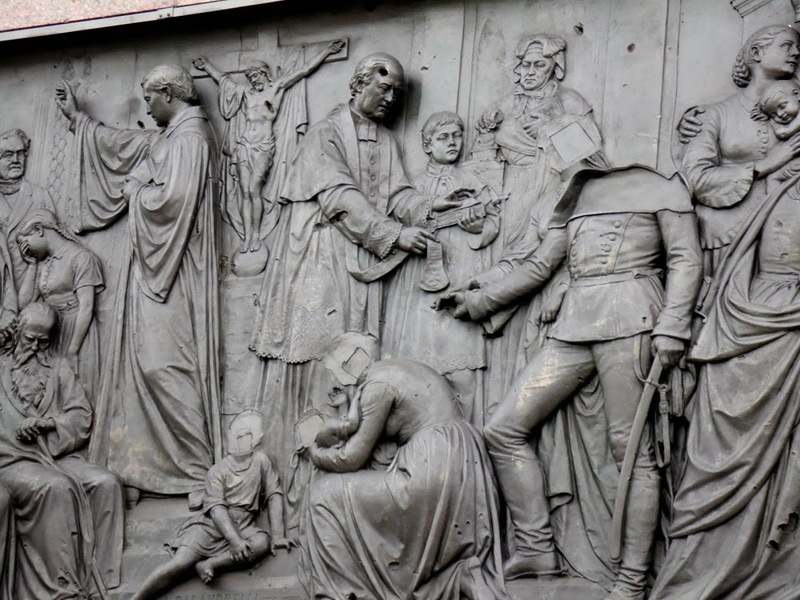 The United States and British occupying powers voted against the demolition, with the USSR abstaining, but they let France take three of the four relief panels back to Paris as spoils of war, leaving behind the 'Victorious Prussian army entering Berlin' one, which was stored at the Zitadelle Spandau. 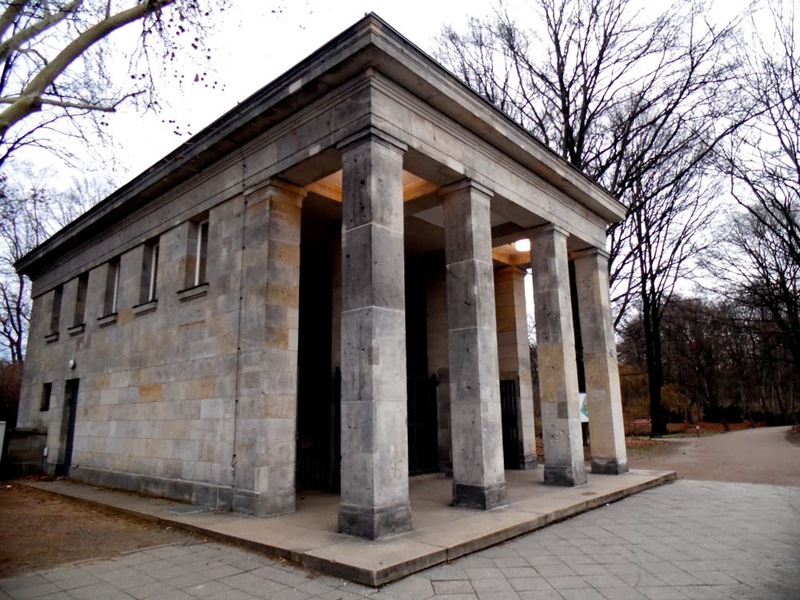 The three Parisian panels were reunited back in their original location with the one from Spandau in 1987 for the 750th anniversary of the founding of Berlin. Priest with a hole in his head gives the Sacrament to a headless soldier. Strange times indeed. If you want to see the glass mosaics in better detail, you will have to pay an entrance fee, but it is only about 3€ and you also get to climb to the viewing platform just below Goldelse's feet. 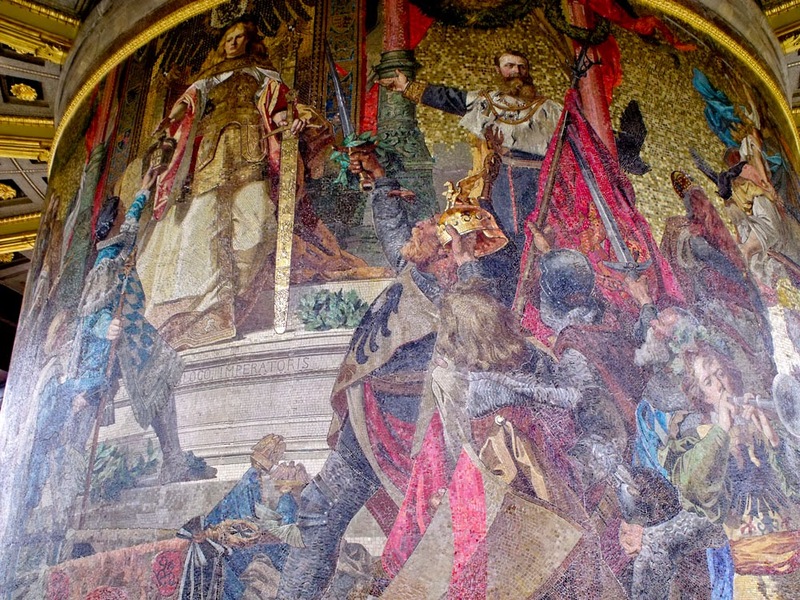 The mosaics are very OTT about the historical imperative of Prussia defeating her enemies and leading to a unified nation of the Germanic tribes under the one Kaiser and a second Reich etc. etc. You can sort of understand why the French wanted to dynamite it all. 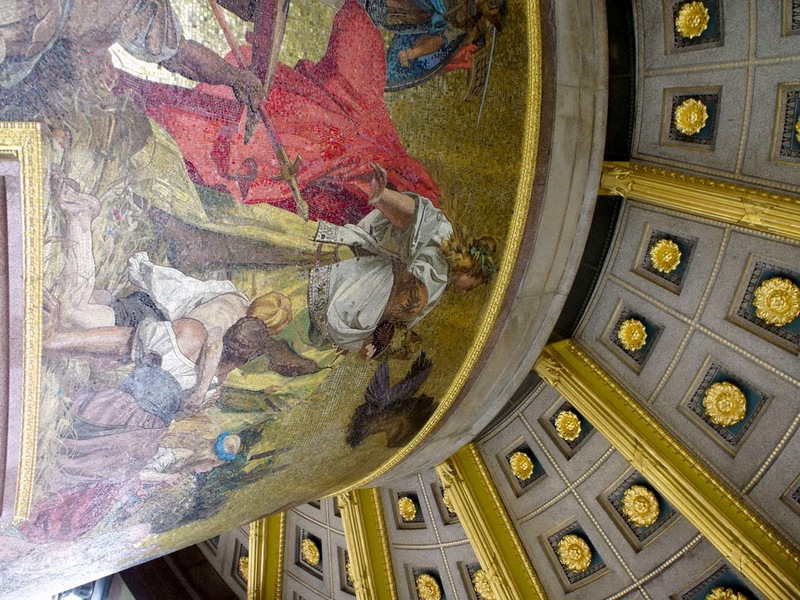 But from a bit of temporal distance, they are quite interesting to look at from an historical point of view. Anton von Werner might have been the hottest must-have patriotic painter of his time, but he was no Michelangelo. 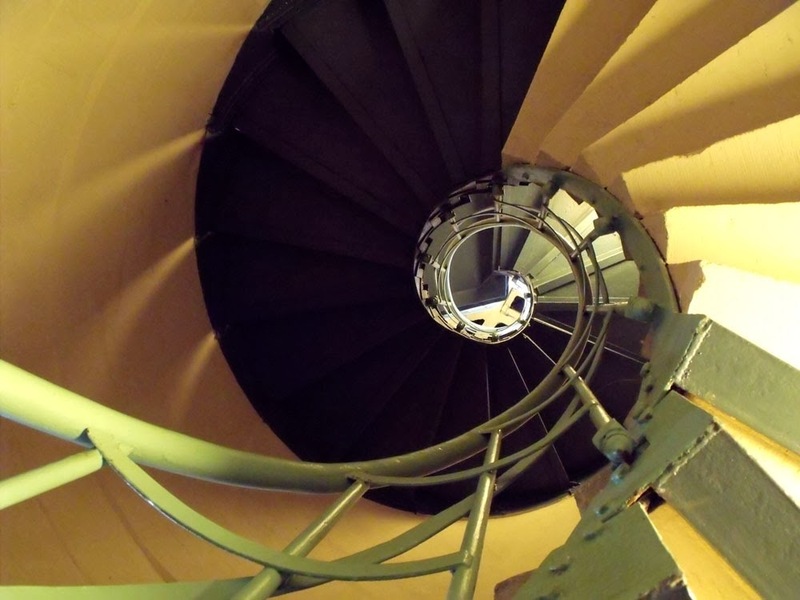 After you have admired or otherwise the mosaics, it is time to ascend the 285 steps to the viewing platform. Needless-to-say, there are no disabled facilities here. 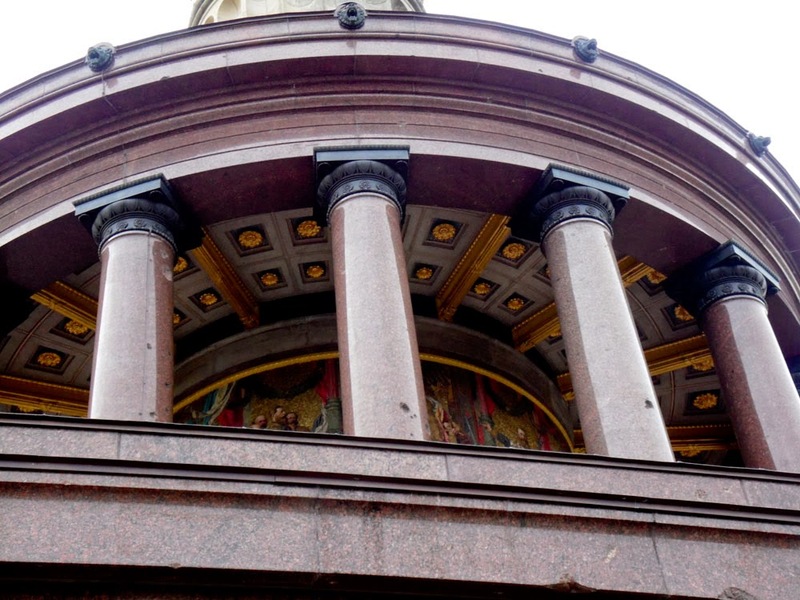 By comparison, The Monument to the Great Fire of London has 311 steps, but you do get a certificate if you climb them. When we first visited Berlin (for The Cure 'Trilogy' concert in 2002) the walls beside the steps up to the top were covered in graffiti. I must admit that I added my own, declaring our love for one another. 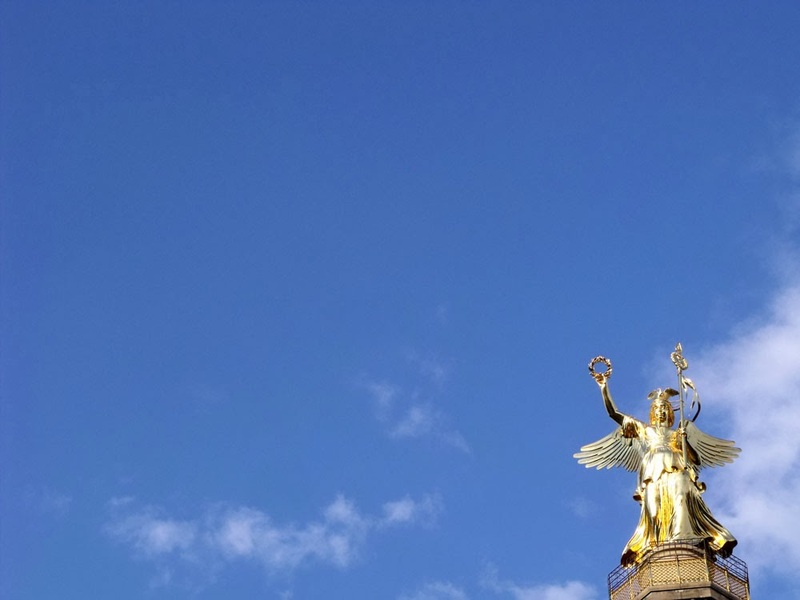 The Siegessäule has since been renovated (2010-2011) and our little addition to the monument has been painted over, which is sad in a way, but we have to admit that the Siegessäule does look a lot better for it. Goldelse herself got a new gilding of 1,200 grammes of pure gold leaf, leading to comments that she was getting 'das teuerste Kleid Berlin' (the most expensive dress in Berlin). 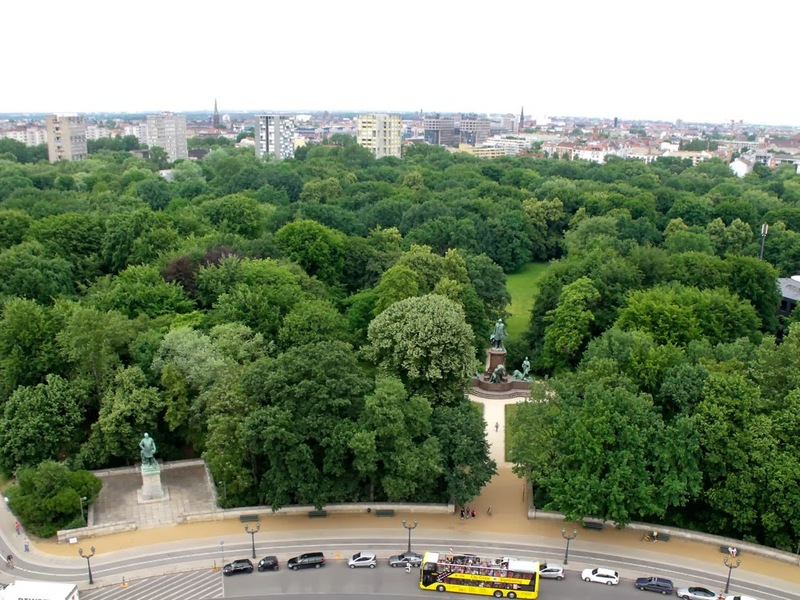 The panoramic view from the top is truly marvellous, and gives you a good sense of scale of how big the Tiergarten - that wonderful oasis of Green in the centre of a capital city - actually is. 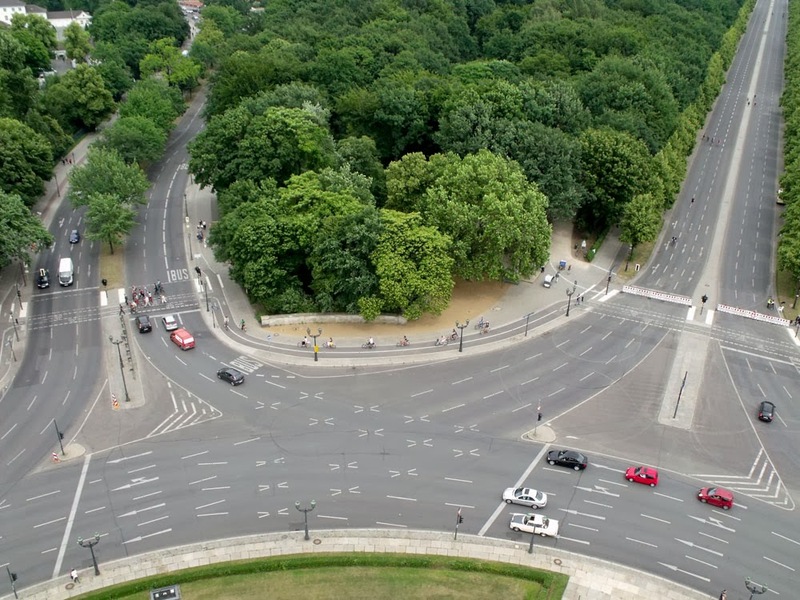 Straße des 17. Juni looking East towards the Reichstag Building and the Brandenburg Gate. This was Speer's planned East-West axis for World Capital Germania. You can also see the plans for the Großer Stern being a monument to the Second Reich, with the monuments to the Prussian military leaders arranged around it. You also get a rather different view of Goldelse, who is one Big Mamma! Getting close up and intimate with Goldelse! Doesn't everybody look like ants down there! The Field Marshall Moltke Denkmal is bottom left. You may know that Mark Twain had a deep affection for Germany and the German language, often staying with his family in Berlin. 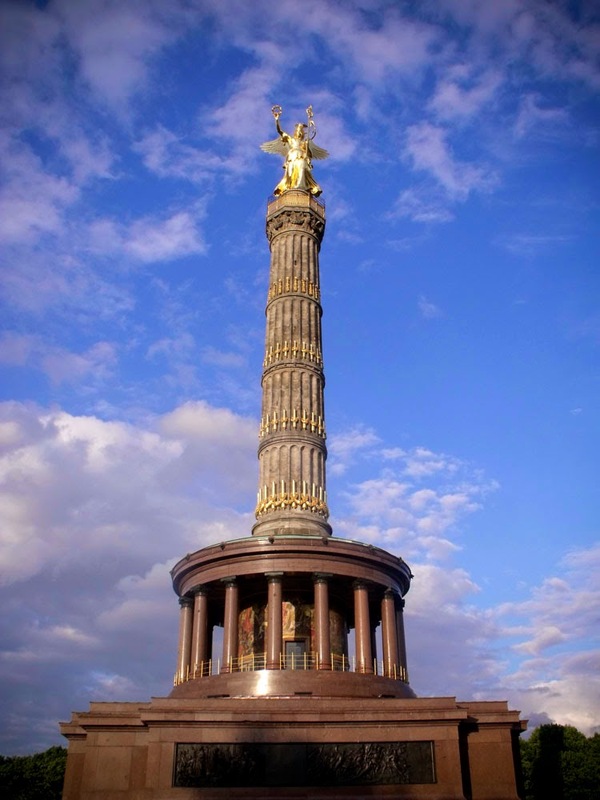 He wasn't complimentary about the Siegessäule, calling it a belligerent, thuggish, gaudy 'Schandfleck' (eyesore). He later became more conciliatory about it, admitting that the Siegessäule was only scraggy from behind. I disagree, and am gladdened when I catch a glimpse of Goldelse, often unexpected as you are walking around West Berlin. I deplore the militarism it originally stood for, and its integration into Speer and Hitler's megalomaniac plans. Nowadays that is all behind Golden Lizzy, and instead of military parades she smiles down on drunken revellers celebrating football victories on the Festival Mile, exuberant New Year rock bands and firework displays, or people running the Berlin marathon. Her complete rehabilitation must have come when the Siegessäule became the centre of Berlin's infamous Love Parades in the 1990's, and was taken as the name for the magazine for Queer Berlin's LGBT communitywww.siegessaeule.de. Old Bismarck would have exploded in apoplectic rage at the very thought! Love your blog.... It's so interesting and helpful as I'm in the early stages of studying German. I've been a Germanophile for years, but never seriously studied the language until recently. Your blog is a nice cultural compliment to those studies.